We got in decently before dark and found a place in tent city next to both Faire security and the skate park. We were less enthused about the skate park, but I hung the tapestry blankets I brought on the fence and gained us a bit more privacy that way. We made the usual round of hello’s and checked in with Royal Magick, took a walk and called it a night. Of course neither Dara nor I were actually tired so sleep was a bit scarce. I stayed up late drawing on the iPad until I started nodding off. Saturday morning dawned bright, clear, and in all ways perfect as far as the weather was concerned. We ran three different sets, mostly Trad. for the first set, sea songs and shanties for the second, and fairie tales for the third. Generally I’m happy with how the shows went, except that I ought to have built the sea set differently. It went from high energy to laments to high energy, and while there were people who liked both styles they were not the same people, which meant the audience would abruptly change when we did. 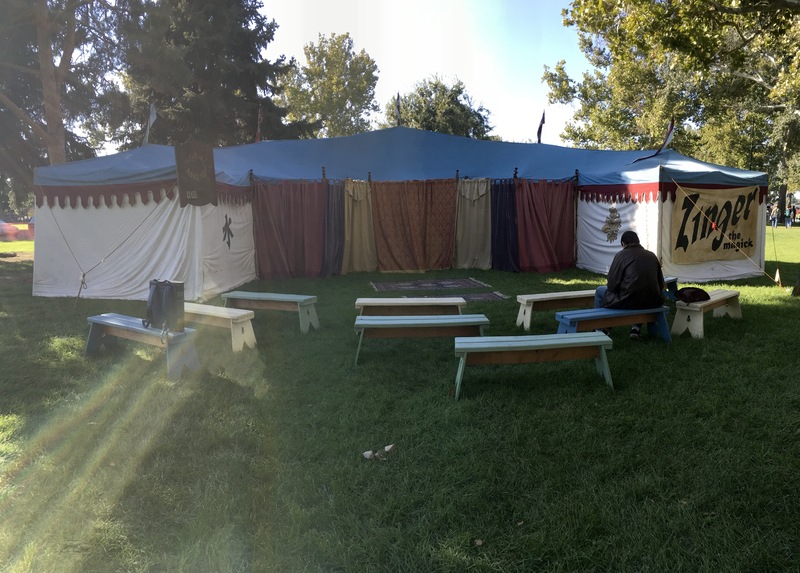 Still, we managed to lure over a vendor or two, the occasional other musician, and even my brother, as well as several bright-eyed faire goers. A small girl decided we needed to be tipped in goldfish crackers while we were performing, and was pretty adorable about making sure we ate. Amusing points during the trip include strange green and white candy that looked like a peppermint and tasted like… lime creamsicle? 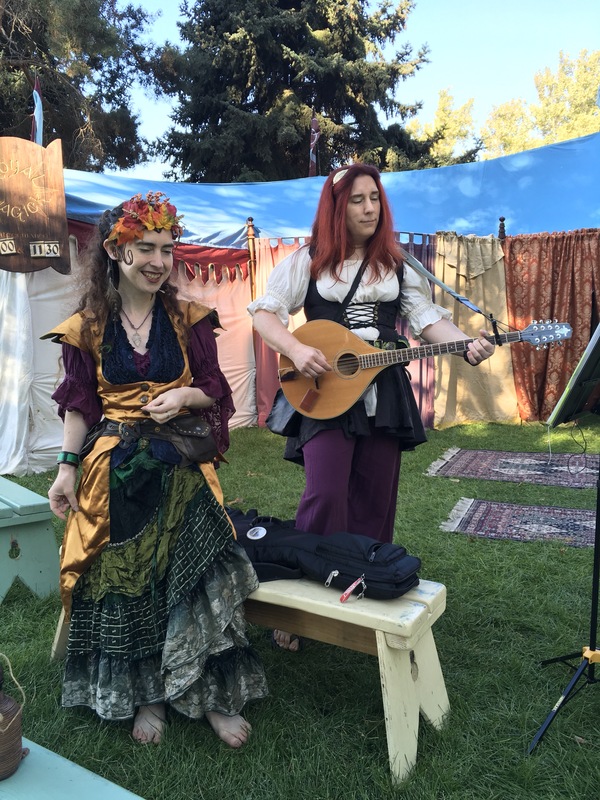 There was boy at the skatepark who screamed that I was an alien and terrifying… and then did the same to Dara who explained why we were dressed up and about the Faire. He seemed to be having fun being scared of the aliens so I found the whole thing entertaining. Last of all, coming home we saw a car with what at first looked like a very tall T pole sticking out of the top and we were utterly baffled. Finally Dara brought our car close enough that we could make out the T bar was actually a disc on top and that it was a short wave radio antenna. Less amusing points include both of my thermarests/air mattresses spontaneously deciding to leak, and the seam sealant on my tent coming completely off (forcing some emergency sewing back on of tent parts). No rain so the latter wasn’t as bad as it could have been, but I’m not quite sure what caused it. A huge thank you to Marjorie and the staff of Faire for having us and for doing their best to make sure we were taken care of. As always it has been a pleasure, and I’m already looking forward to next year! Category: ConcertsTags: Events, Fairy Tales, Renaissance Faire, Sea songs, Trad.